Leighanne Levensaler: Hi, this is Leighanne Levensaler, co-head and managing director, Workday Ventures, and I’m here to talk with Brett Hurt, co-founder and CEO of data.world. We’ll be talking about, you guessed it, data. We’ll also be talking about the partnership between Workday and data.world. Hello, Brett. Thanks for joining me here today. Brett Hurt: Hey, how are you, Leighanne? Thanks so much for having me. It’s really high energy to be here on the expo floor surrounded by 11,000 people. Levensaler: It is. It is day three of the Workday Rising conference. We’re delighted to have you all here, it’s been a full program, so thanks for making the time for this podcast. Levensaler: Okay, so Brett you have a long history of seeing data change cultures as the founder and former CEO of Bazaarvoice and Coremetrics before data.world. Both companies became large global companies, and I believe that Coremetrics sold to IBM for $300 million? And Bazaarvoice went public at a billion-dollar valuation. So, before we jump into your current project, data.world, what can you share that you’ve learned at those companies about this area? Of building a data-driven culture? Hurt: Yeah, I’ve been on this journey for a long time. That data is very liberating, and it’s an ultimate source of truth. At Coremetrics, just to take you back to that time, I was 26 years old and e-commerce was really just beginning. During those days you may remember metrics like page views and unique visitors being kind of the gold standard of whether or not a business online was performing. And the reality is those metrics were pretty meaningless. They were just kind of interest metrics, they didn’t tell you how your advertising was performing, how your merchandising was doing. If you rolled out a big site redesign, or implemented some new tool on your e-commerce site, you had no idea really how effective that was. And so I came from this business that I had founded before Coremetrics, where I had my own e-commerce site, and I grew up in a family of retailers and growing up working in their stores. To me, it was kind of intuitive that you would want to know what your customers were doing. You would ask them how they found you, et cetera. And I was blind in operating my own online store, and so I started to build metrics that would really illuminate what was happening inside this black box. And eventually founded Coremetrics. Found that that was a huge market opportunity, that people like Amazon and CDNow were shockingly behind where I was with this little, tiny e-commerce site that I had built. Leighanne Levensaler and Brett Hurt discuss the power of data at Workday Rising. Levensaler: Was it a lack of their innovation agenda not being quite where it needed to be? Or was it just white space that they just didn’t see? Getting back to kind of that source of truth, and how data changes culture, at Coremetrics you would see clients like Eddie Bauer, who had been debating every Monday morning for four hours like, “What goes on the hero image on their homepage?” Because they were thinking like a cataloger. They were used to that. Catalogs all about imagery and they were thinking, “I’ll just apply this to the web.” And we came along, and we showed them that only 5 percent of people ever clicked on that hero image on the home page. Hurt: I was like, “For the first time in history we’re gonna tell you precisely which half is wasted.” And if you fast forward to Bazaarvoice, Bazaarvoice was the source of truth for products and services. It became the world’s largest social commerce company in a Software-as-a-Service format. It became a large public company. And believe it or not, in 2005, when I started that company with my co-founder Brant, there were only three retailers in the entire United States who had customer reviews. This was just 2005, right? Couple of years before the iPhone came out. Facebook was closed to the public. There was no Snapchat, there was no Instagram. It was the first time in history where you were actually able to predict what the return rates were going to be for these products. If you had a product flying off the shelves you could have a very early signal that you need to double-down on the inventory for that, because this is gonna be a very hot product relative to your average. So it caused a sea change in commerce again where when people had source to the truth, which was really just word of mouth in a digital form, they had this really very precise ability to merchandise and figure out why this decisions support system was flashing a red light saying that product that you sold three months ago had this enormously high return rate, which is super costly in stores and everything else. And really figure out why that happened, and create a whole new process around it. Our client summits at both Coremetrics and Bazaarvoice were all around how data changes culture. And now to be able to do it at data.world on a much larger scale for lots of industries is really, really exciting. Hurt: And you know, this reminds me that history always repeats itself. There are so many patterns at the beginning of data.world that take me straight back to the beginning of Coremetrics. I could talk about those as we get into this, but history really does repeat itself. Levensaler: Let’s talk about your mission statement at data.world now. It’s to build the world’s most abundant, collaborative and meaningful data resource. How do you assess the state of today’s data in the world? Hurt: This is one of those mission statements that’ll be true 100 years from now. Hurt: It is very, very ambitious. It’s my most ambitious and exciting business to date. Here’s the deal, it’s really kind of shocking for the age that we live in. We live in this networked age where we all have super computers in our pocket and we just expect to have access to the world’s information through Google and through Wikipedia. The next generation is growing up with just instant access to knowledge. But the reality is that when you go on the internet today and you go look for data, data sets about climate change, about cancer, about anything you can imagine, the state of most of the world’s data today is highly siloed, highly undocumented. You don’t have any idea what people have done with the data before you came along, so you’re bound to repeat whatever cleanup work they did. Let’s take something as amazing as data.gov. That was announced under the Obama administration. Levensaler: It’s a fantastic resource. Hurt: It’s a fantastic resource. They’ve been a partner of ours since close to the beginning of our company. All of data.gov is on data.world as well. Levensaler: I didn’t know that. Hurt: Yeah, and DJ Patel is one of our advisory board members. He was the nation’s first chief data scientist. He actually co-invented that term, data scientist. Talk about kind of owning a category when you invent the term and then you become the nation’s chief data scientist. So cool. If you look at data.gov and you find a data set on data.gov that you want to work with, it’s not well documented almost all the time, you have no idea all the people that came before you on data.gov and worked with it. And you don’t know how other people have joined it to other data sets, you don’t know how it’s been linked to the rest of the world’s knowledge. It’s almost like you’re beginning the ground floor over and over and over again. Levensaler: And it changes, too. Those data sets tend to change, the ontologies, they’re not static at all. Hurt: Right. Exactly. So that’s the state. That’s kind of the gold standard. If you look at data inside universities, it very often gets orphaned. A professor will retire that was putting that data set together and had been doing it over the years and the work just falls off. Nobody knows how it was prepared in the first place. Inside of companies, this is a huge problem because data is, again, highly siloed inside these companies. So the waste in human labor and productivity is just massive. The sad thing is that, that really holds us back, from progressing as human beings…my mom unfortunately passed away from cancer. Cancer is a very data-driven problem. You may remember that Vice President Joe Biden, when he lost his son, created the Cancer Moonshot, and he was trying to bring people together organized around data to say, “We can solve this problem if we collaborate.” If you look at most of the breakthroughs in human history, it has been the serendipity of people that had been working on the same problem, maybe in different countries, that all of a sudden come together at maybe a conference like this one, and then create that kind of breakthrough insight. Hurt: And innovation. We’re trying to accelerate that on a massive scale both within companies, within foundations, within universities, within government agencies. It is a very ambitious and exciting business. Levensaler: And just at a high level, how do you do it sort of mechanically? What are some of the feature sets or capabilities that are available to organizations? Hurt: At this point, a couple of things there. At this point we’ve now created the world’s largest collaborative data community. It’s actually grown faster than GitHub grew in its first two years of being live. We just celebrated our second anniversary being live on July 11. That’s given us a lot of know-how. One of the things that we recently came out with for not just our clients but for the community, is this ability for the queries that they will run on data to be pre-processed. Now, 25 percent of all queries run in data.world return in milliseconds, because we have such a wide lens to look at and optimize from. That creates a real asset for companies that we work with because decentralization is the norm, and the marketing team and a lot of Fortune 500 companies use a different analytics platform than this team over in merchandising, for example. So they’re not speaking the same language. There’s no kind of lingua franca in the organization. The other aspect of that, kind of a third asset, is the foundation of our platform. Our platforms are all built on top of something called the Semantic Web. We’ve got a whitepaper about this so I’ll try to not make this super technical, and our whitepaper is not very technical. We’re trying to make it very accessible to everybody. But what the Semantic Web is when it pertains to data is it allows data to enjoy the same type of network effect that pages have enjoyed on the web. You actually use the Semantic Web every day in data on Facebook. So, anytime you type in, for example, I was just doing this podcast with Brett and we’re friends on FB and it highlights my name, and you kind of confirm it, now that takes you to a data entity called Brett Hurt on Facebook with everything that’s known about me that I put out there. If they’re a friend of mine, or a mutual friend, they’re going to see everything. If they’re not, then they’re going to see only what I’ve shared in public. So our whole platform is built on top of the Semantic Web. And why companies should care about that is, that it means that when you use data.world in a company and you drag and drop something like a spreadsheet you’ve been working on, and let’s say there’s product IDs in that spreadsheet. You’re trying to figure this spring clearance analysis. So you drag and drop it in and now immediately data.world will prompt you and say, “It looks like you’ve uploaded a spreadsheet that has product IDs that map to this product catalog inside of your company. Is that correct?” If you say yes, now it’ll tell you everything known about those products. Levensaler: So it’s reconciling them for you? So amazing. Levensaler: It’s truly democratizing, which is absolutely fantastic. In my intro, I mentioned my work with Workday Ventures and said this is a problem that we see across all of our companies, across every industry. Last week, as you just mentioned, we announced an investment in data.world, and now with that investment comes partnership. I think the most important part of this discussion is the partnership between Workday and data.world. What was attractive to you about Workday, becoming a partner with Workday? Hurt: Oh gosh. There’s so much. First of all, Workday is one of the world’s largest Software-as-a-Service companies. I mean, I’ve had successes an entrepreneur, and I’m very grateful for that, but I’d never built a company the size of Workday, not even close. Just getting access to you, Leighanne, to Mark Peak, to Brittany Skoda, to your executive team that has so much know-how of how to build large companies, is super valuable to us. Also, I think your clients have a real need for what we do, and being able to collaborate and work with them is a huge gift to us and gift to them. It came together in such a beautiful way. As you said earlier, this industry really needs to be kind of modernized in this area, that it’s lagged behind. It makes sense that it’s lagged behind by the way. The reason retail was such an early adopter with Coremetrics back when I was 26, 20 years ago, is that retail is such a thin margin. I mean, it lives and dies on its sales and its promotions. So they had to become good at it quickly or they would perish. I don’t think there’s been that same level of need and urgency in HR, and it’s just a missed opportunity because of course people live and die by the talent that they have, and the retention rates that they have for that talent. I’ll tell you, one of the things that millennials are not going to put up with when they go work for these large companies is they’re just not going to put up with not having instant access to the answers that they need to run the business. If you to go work for a company like Warby Parker today, which was built from the ground up around data, it was built from the ground up around bits instead of atoms. You go work for them, 80 percent of their employees are using an internally built data portal on a daily or weekly basis to make data-driven decisions. This prevents people from making bad decisions, from gut-level decisions, types of decisions Eddie Bauer was making when it was debating that catalog image on its home page for four hours every Monday morning. Levensaler: But that is the digital divide that you talk about, because companies that have been around that aren’t digital-first, aren’t cloud-native companies, and not really born in this last decade, they have a legacy. Levensaler: They have a legacy and so many companies are trying to bridge that divide right now and trying to get to the future without being completely disruptive to their core business. So it is a great challenge. The kind of companies that Workday serves, we serve the Warby Parkers, we serve the digital-first companies, but we also have a bedrock of companies that are Fortune 500, Fortune 50 companies, that are really trying to transform. That’s our digital transformation right now. Hurt: Right. Many of them are. They’re definitely aware of this problem, and that’s why you see many of them, actually, Gartner predicts it, 90 percent of the largest companies in the U.S. will soon have what’s called a chief data officer. Hurt: And the number one person that a chief data officer reports to, like 29 percent of chief data officers report to the CEO. The number three person they report to is the COO. So around 50 percent of all chief data officers are reporting to either the CEO or the COO. These are companies that really get it because they realize the value of data and that they need to drive a cultural revolution in the company to be more like, operate more like a Warby Parker. That’s a great call to action for us. I’ve gotten to see that at the beginning of my entrepreneur career, but like with Coremetrics, it was at the advent of the VP of e-commerce, and we’re going to make them successful. At Bazaarvoice, it was the advent of the CMO, and we’re going to make them successful. Now with data.world, it’s the advent of the chief data officer. Hurt: The other thing that Gartner predicts is that 50 percent of them will fail within a two-year period. I think that’s normal from the standpoint of these jobs aren’t super well-defined right now because they’re so new. So you’ve got to come along and be able to really help. What really turns me on in business is seeing a cultural transformation like hopefully being a tiny part of business history where you see a light bulb go on and it changes the industry. Like with Bazaarvoice, we’ll never know a world without customer reviews now. It’s ubiquitous. Bazaarvoice grew into a company with 38 international languages, thousands of clients all over the world. With Coremetrics, we’ll never know a world now where you’re not accountable directly to how your advertising’s performing, how your merchandise is performing, because you have no excuse. You know exactly. Not that people want an excuse. They want the truth. But in the data space, I think there’s been a great disservice done to companies because unfortunately, a lot of efforts have been focused around quants and people that are kind of brainiacs, and selling to them. The reality is, the whole company needs to be data-driven, not just like the data scientists. Levensaler: Yeah, you really need to turn to business leaders. So I often wonder, and I sit on both sides of this debate. Is a chief data officer a transitional role to get the organization to have a data-driven culture? And then the requisite functional leaders are transformed, right? Levensaler: That’s not an enduring role, it’s a transitional role. It’s something to consider where part of all of our responsibilities, and capabilities that we would bring to our roles, would be data intensive, supportive of a data culture. Levensaler: Regardless of the function. Hurt: Yeah, it’s a very interesting question. I think the answer is no, it’s not transitional. It’s too complicated to be transitional. Here’s what I mean by that. Part of the chief data officer’s charter is not just to be a cultural change agent, but also to go out and acquire the world’s knowledge on behalf of the company. So how do you make sense of all these people trying to sell you data? Levensaler: So it’s a new business function? Hurt: I really think it is. Hurt: Because I think today it’s not clear. If you’re at Axiom or Experian, who do you call? Hurt: You’d maybe call the CMO or something, but is a CMO equipped to be a real expert in vetting, whether or not that data is good for your organization? Levensaler: Yeah, particularly if you want it cross-functional as we were talking about earlier. Chances are this analysis is being done in a different context somewhere else in the organization. How would you know if they were independent? That’s a very good point. Levensaler: And they’re still applying their judgment. They’re taking their predictions, they’re taking the data, they’re taking the predictions that were created off of the data, they’re applying their judgment, and they’re having better outcomes. Levensaler: It’s just augmented intelligence. It’s augmenting the human. It’s not replacing it. Hurt: There’s so much creativity required in business, yeah. I think we’re a long way off from kind of an AI doing all that stuff. Levensaler: Intelligent beings taking input on things they don’t understand or don’t know. Right. We talked about that yesterday actually in the keynote for Workday Rising. That’s excellent. Okay, so what can Workday customers look forward to on the integration front with data.world? I have some things to share, but I’m curious. Hurt: Yeah, so we’re obviously hot off the presses. We just announced last week with you guys, and could not be more honored to have you guys invest in us and believe in us. There’s so many opportunities. One very obvious opportunity is on the Workday Cloud Platform side. 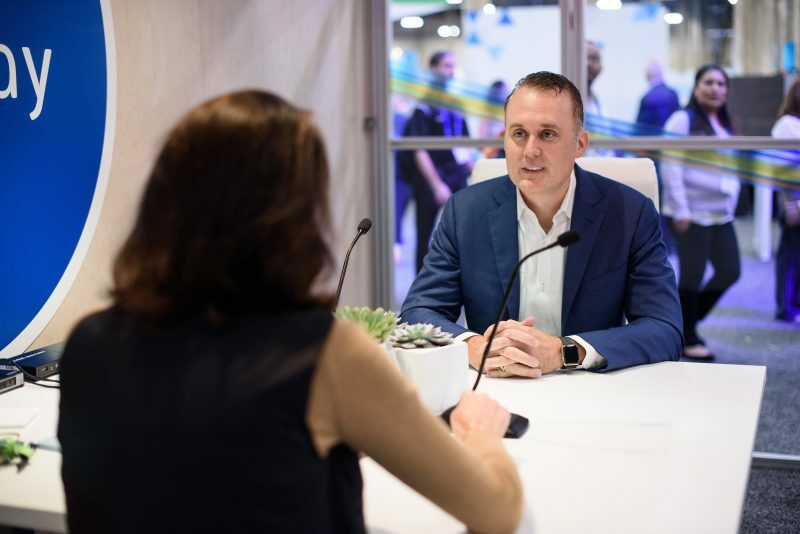 I spent a lot of time with that team yesterday, and there’s so many different ways I think we’ll be able to integrate there and hopefully have a big presence in helping clients that are using the Workday Cloud Platform. Levensaler: And they’re building applications on the Workday Cloud Platform. They’re extending Workday. But in almost all cases, they are trying to work with other data sets to create experiences for their users, whether it’s around our financial management footprint, or human capital management footprint. In almost all cases, they’re ingesting or bringing in other data sets. We really look forward to having data.world as a first-class citizen service as part of the Workday Cloud Platform, too. Levensaler: So that’s an exciting opportunity for us. Levensaler: I feel like we leapfrog in HCM. Hurt: Exactly, I think so. Levensaler: We almost don’t even have a legacy. I don’t want to undervalue a lot of the wonderful activity that has been happening, but as a whole, not some of the more innovative companies. We can leapfrog. We can go from effectively reporting and with obsolete data to leapfrogging into this future state of a truly collaborative environment with rich analytics and distribution tools from Workday as well. So it’s just a nice marriage here. Levensaler: We’re super excited about it. Hurt: Really excited about it, too. Levensaler: Thank you for taking the time for this podcast, Brett. It’s been wonderful. Thank you for those of you who are listening to this podcast. I’m Leighanne Levensaler and this is the Workday podcast. Thanks for listening. Hurt: Thank you so much.